As I’ve posted before, we love peanut butter! We we spread it on toast, dollop it into morning porridge, dip carrot and apple sticks into it and even eat it by the spoonful. I usually buy Whole Earth Organic Peanut butter which is £3.19 a jar. Yet we can sometimes get through a whopping 3 jars a month! Seeing as we’re trying to feed our family for just £100 this month, I thought it high time I attempted my own. The results were outstanding! Delicious liquid gold! I have sworn never to get shop bought peanut butter every again. Peanuts are rich in energy and contain many health benefiting nutrients, minerals, antioxidants and vitamins. They contain sufficient levels of mono-unsaturated fatty acids especially oleic acid which helps lower LDL or “bad cholesterol” and increase HDL or “good cholesterol” level in the blood. The kernels are a good source of dietary protein; compose fine quality amino acids that are essential for growth and development, and the husks are a fantastic source of fibre. Research studies have shown that peanuts contain high concentrations of resveratrol and other poly-phenolic antioxidants, thought to have a protective function against heart disease, stroke, cancers and Alzheimer’s. 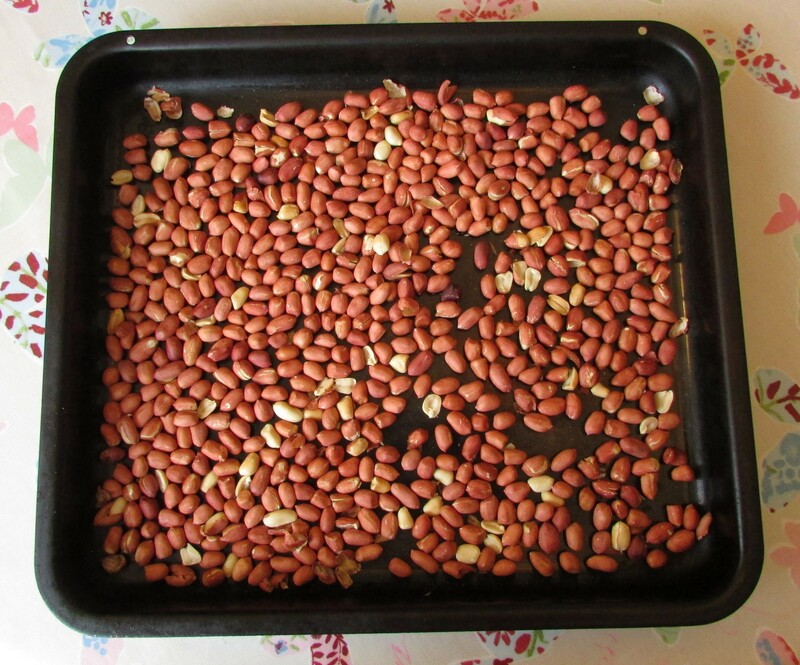 Roasting or boiling apparently enhances the antioxidant bio-availability in the peanuts. Peanuts also score well on vitamin and mineral levels containing good amounts of vitamin E, B complex vitamins and folic acid. 100g of peanuts provides about 85% of RDA of niacin (B3), which contribute to brain health and blood flow to the brain. They are also are rich source of minerals like copper, manganese, potassium, calcium, iron, magnesium, zinc, and selenium essential for bone health. Roast some skin on organic peanuts in a hot oven for 10-15 minutes until you see a sheen of oil appear on the dark skins. Place the nuts into a blender (I used a Kenwood) and blend for 5-10 minutes. Firstly you’ll see the peanuts blend into a crumb, then after a few more minutes the oil will start to ooze and it will become more liquid. Keep going until you have the consistency you require. I added no salt or sugar – it simply didn’t need it. Supermarket nuts can be expensive. I buy kilo bags online from places like wholefoods online. 1 kg is about £4 and 5 kg is £17. If you’re able to buy in bulk you can save a fortune. 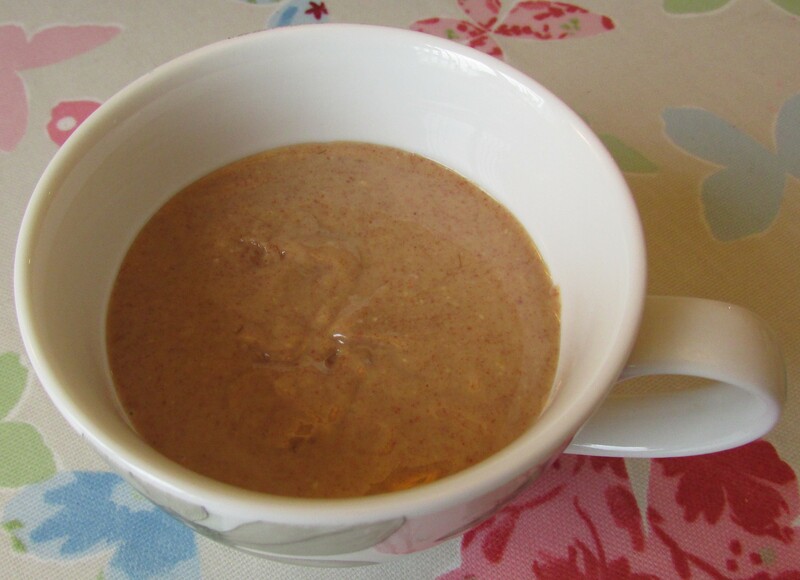 this recipe also works well for cashew and almond nut butters – deliciously healthy. This entry was posted in Budget Breakfasts, Frugal family recipes on January 12, 2015 by carolinementzer.